A serger, or overlocking machine, gives you the chance to enhance your projects with a professional finish to hems and seams. 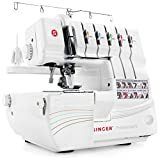 Sergers will not be able to complete functions such as attach zippers, embroider or sew buttonholes; for those tasks you need a sewing machine. However, many people who own sewing machines often add a serger to their sewing arsenal for other reasons. If you intend to make clothes or complete home-decor projects such as napkins, a serger could be perfect for you. It will quickly create a beautifully finished appearance, which will be durable. Your seams will look just like those bought in the store – or better. In one pass, it will trim, stitch and finish your seams. It can also help you create decorative rolled hems on knits and stretch fabrics. This video briefly explains what a serger is and what it can do. Sergers can vary in price from a couple of hundred dollars up to several thousand. Unless you plan to use one for commercial purposes, many entry level sergers can create appropriate hems and seams. These are our top five sergers. Brother has been a go-to name in the sewing machine industry for many years. They produce different types at all price ranges. This serger is a perfect complement to any sewing machine. It measures 15.2 by 14.5 inches and weighs 16.4 pounds. The Brother 1034DX has a differential fabric feed and can sew up to 1,300 stitches per minute. The foot control allows you to increase or decrease the sewing speed to suit your project. The machine is fully color-coded for easy threading. It leads you through each step of the threading process, following the appropriate color, for each thread. The system is designed to ensure that each thread stays in the right place. There are various stitch options. These include a four-thread overlock, three-thread overlock, rolled hem, narrow hem, and ribbon lock. It works with three or four threads, making it very flexible. You could use four threads and two needles in a woven fabric for a strong overlocked seam. Alternatively, use three threads and one needle for an overlocking seam on slacks, knits or blouses. There is a dial that allows the stitch width to be adjusted—between 0.19 inches up to 0.28 inches (5mm to 7mm). There is also a dial that adjusts the differential feed between a ratio of 0.7 and 2.0. This helps produce decorative wavy edges and prevents fabric puckering. The machine has a removable trim trap to catch the fabric cut off. It also has three different feet: one standard, one for a blind hem and one for gathering. The standard foot is a general purpose one. It is used for creating seams and rolled hems, as well as neatly-trimmed edges. The blind-hem foot is used for edge stitching and joining fabrics, as well as attaching delicate materials such as lace. It’s also used for utility stitches and embellishments. The gathering foot gathers and connects fabrics without the need for pins. It also creates a serged edge and can gather one to two layers of fabric. The 1034DX comes with four mini-threads, four needles, and four thread nets. There is an instructional DVD and Brother offers lifetime customer-service support. The machine has a 25-year limited warranty. Differential feed ratio of 0.7 to 2.0. Timing can sometimes drop out of sync. The blade can break if it hits a pin. Singer is synonymous with the creation of sewing machines, having patented their first in the late 1800s. This Singer model is no exception to their top quality machines. It measures 14 by 11 by 11.5 inches and weighs 13.5 pounds. The ProFinish has a fully adjustable differential feed, ensuring no puckering or breakage when stitching. It allows stitching at speeds of up to 1,300 per minute. Threading is a breeze with the color-coded system. There is also a handy diagram, detailing the threading, printed on the front right-hand side of the machine. The stitch length and width are both adjustable via dials on the side of the machine. This enables the machine to sew a wide variety of fabrics with ease. The tension is also adjustable for different weights and types of thread. 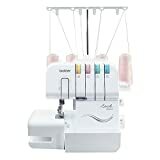 The serger has a “2-3-4” thread-stitching capability that can be changed to sew a professionally finished seam or hem. You can choose from many stitches. These include a two-thread wrapped overlock stitch or a two-thread rolled hem. Using three threads you can overlock a hem or a concealed seam, or sew a three-thread overlocked edge. Four threads will sew a strong, mock-safety stitch. There is an optional free arm for stitching cuffs and sleeves. There is also a built-in rolled hem mode accessed via a lever, which places the stitch finger in the right position. The ProFinish has a carrying handle making it easy to move or transport. Accessories include an all-purpose foot, tweezers, a screwdriver, and a needle set. There is a spreader for two-thread stitches and a foot control. An instruction manual and stitch guide are also supplied. There is a 25-year limited warranty from the manufacturer. Easy thread color-coded system, with a printed diagram on the machine. Optional free-arm for sleeves and cuffs. Adjustable stitch width, length, and tension. Can be a little loud in operation. 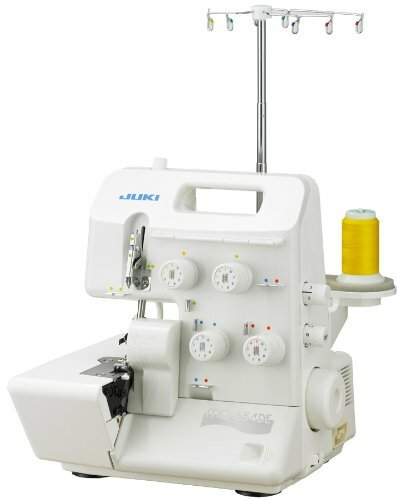 Juki produces a large number of industrial sewing machines. It has brought this know-how to the household appliance market. The machines are known for their ease of use and high quality—as well as their dedicated drive-cutting system. These features are all found in the Juki Pearl Line machines. This machine measures 18.1 by 14.6 by 13.9 inches and weighs 19.75 pounds. The threading system is color-coded. There is a breakaway looper, making it easy to thread correctly the first time. The upper knife moves away when threading for safe access. The MO-654DE has a “2-3-4” thread configuration with an automatic rolled hem feature and the stitches can be adjusted in length and width. The dials for changing them are on the outside of the machine for ease of use. The tension of the thread can also be changed to suit different threads. The knife adjustment can be calibrated to suit different fabrics and projects. A multi-purpose foot is fitted as standard, to encompass stitching a variety of seams and edges. These include adding products like tape and elastic. There is a micro safety switch, ensuring the machine cannot operate when the cover door is opened during the threading process. Optional presser feet can be purchased for blind stitching, cording, gathering, piping and more. The machine is supplied with an instruction manual. There is a two-year limited manufacturer’s warranty on electronic parts. It also has a five-year limited warranty on all other parts, with exclusions such as “consumable parts“. These include but are not limited to loopers, feed dogs, knife blades, bulbs, and lamps. Safety cut-off switch when threading. Stitch length, width and tension adjustments. The machine does not have a free arm for cuffs and sleeves. Additional feet are not included. 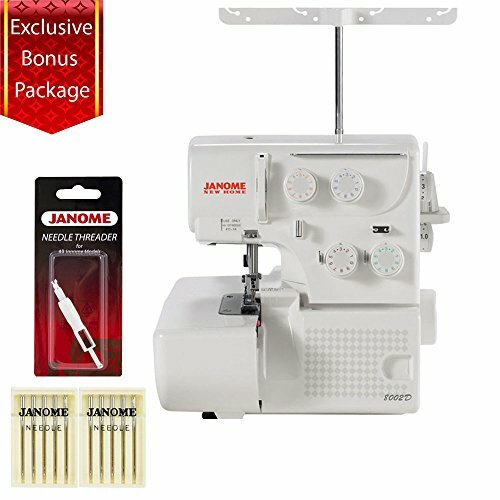 Janome is one of the newer kids on the block when it comes to sewing machines. The Japanese company supplies many innovative machines for the home sewing enthusiast. The 8002D serger is an affordable addition to any machinist’s repertoire. This serger measures 15.2 by 14.6 by 13.7 inches and weighs 17.2 pounds. The 8002D can sew up to 1,300 stitches per minute, regulated by the foot control. It has a color-coded threading chart that makes threading a snap, even for a beginner. Three or four threads can be used to overlock and the cutting width can be adjusted between 0.12 inches and 0.29 inches (3.1mm and 7.3mm). The differential feed ensures fabrics move smoothly through the machine. It will accommodate fabrics up to 0.09 inches (2.25mm). The tension and stitch length can be adjusted to create crisp seams or edges. The machine has a changeover device which can create a rolled hem. The cutting blade can be dropped down or removed for safety. The 8002D comes with accessories, including tweezers, needles, a serger foot, and a screwdriver. There is an instructional video and an instruction book included. Additional feet can be purchased from the manufacturer directly,, or other Janome retailers. The bonus package includes a blind stitch foot and extra needles. Three or four thread overlocking. Adjustable differential feed, tension, and stitch length. Easy threading with a color-coded chart. The lower looper can be hard to thread. Can be noisy in operation. 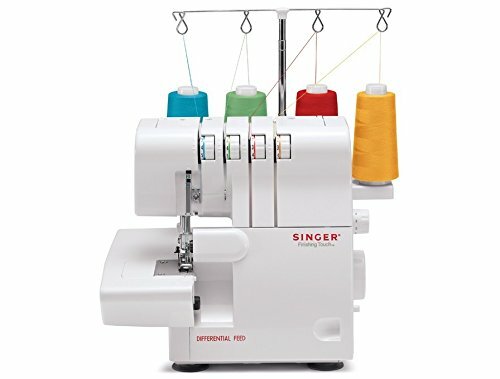 If you are looking for a serger that can also overlock, this machine from Singer could fit the bill. The price is affordable for a machine of this capability, costing less than its closest rivals. It is essentially two machines in one, as it has the option for a coverstitch. 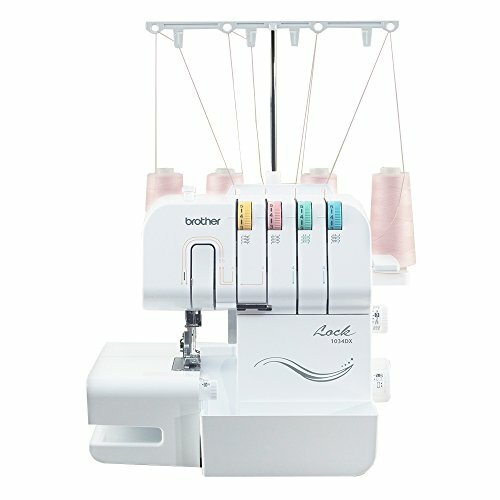 This machine has a “5-4-3-2” thread capability giving a wide selection of stitches for any project. Measuring 13.5 inches by 10.5 inches by 11 inches, it weighs 23 pounds. It has a heavy-duty metal frame ensuring stability during operation. The maximum stitch speed is 1,300 per minute, adjusted by the foot control. It can also sew a coverstitch in three ways: a narrow coverstitch, triple coverstitch or wide coverstitch. This will let you hem many fabrics. You can embellish your projects with a double chain stitch. Sewing stretch fabrics are quick and easy. The serger has the capability for four different rolled hems. This is an advantage when you want to hem a delicate fabric. Choosing which one you want is easy with the access lever that places the stitch finger in the correct place for the rolled hem. Being able to choose between the threads from two up to five gives lots of flexibility on stitching. There is a handy chart printed on the front of the machine, showing which threads you need for which stitch. These include flatlocking, covered hems, and chain stitches. The threading system is a lay-in type and is color coded for ease of threading. There is also a diagram to help you thread the machine, and it comes with a differential feed. The tension is fully automatic and self adjusting. This makes sewing different types of fabric a breeze. Stitch length and width are adjustable using a dial on the side of the machine. There is an attachable pocket to catch fabric and threads cut off as you pass your seam through the machine. This helps keep your sewing space clean and tidy. The Singer comes with an instructional booklet and CD, six presser feet, spare needles, tweezers, screwdrivers and more. It carries a 25-year limited manufacturer’s warranty. The manual can be hard to read when switching between the manual and CD. You might need to follow YouTube videos to solve any threading issues or manual shortfalls. A serger has many useful features. Below we detail some to look out for and explain what they do. There are two feed dogs on a serger that move the fabric through the machine as it’s stitched. The differential feed controls the feed dogs. It is adjustable, enabling you to set it for a perfectly-even seam. This feed can create decorative edges for seams. It will make a ruffle effect by speeding it up. It can also produce a wavy edge, similar to the edge on a leaf of lettuce. There are two options when it comes to threading a serger, manual or automatic. If you have ever threaded a sewing machine, you know this can be fiddly, and that’s just with a single thread. Sergers can have up to four threads, each of which travels on its own route to the needle. Not only that, the steps it passes through must be done in order. Some of the places the thread passes through can be hard to reach. A manually threading serger will often come with tweezers for this reason. Most sergers will have detailed instructions that are easy to follow. Some have a color-coded path to make this process simpler. You might find it can take a while to get used to threading the machine. I dare say you might get it wrong the first few times. However, once you master the threading, it will be a breeze. The alternative is to buy a machine that threads automatically. The downside to this is that they are generally more expensive. There are a few thread options available on a serger. Different stitches with different results can be created, depending on the number of threads the machine has. 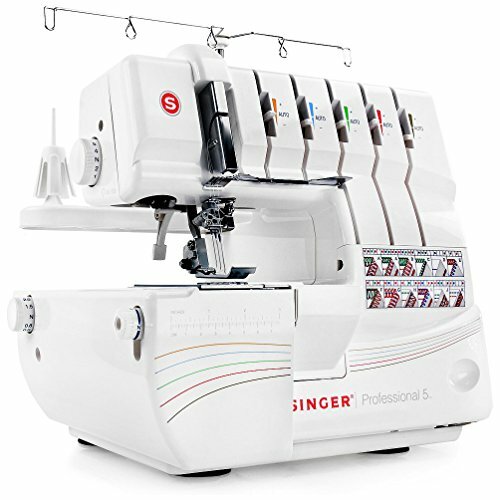 Most entry level sergers will have up to four threads. The four-thread stitches will be more durable than the two-thread option. They are usually indicated by showing a “2-3-4” thread option, a “2-4” thread option or a “2-3-4-5” thread option. A serger that has two to four threads can produce a safety stitch and a two-thread overlocking edge. It uses two threads for each stitch independent from each other. A serger that has three to four threads creates a seam that will be able to stretch slightly. The four-thread seam will be stronger and wider. A machine with this number of threads will usually have an additional throat plate, capable of stitching a rolled hem. The machine encloses the edge of the fabric within the seam to create a rolled hem. Sergers with five or more threads will generally be more expensive. However, it will be capable of sewing a seam similar to that found on store-bought clothing. Three of the threads are used on the overlock and two on the straight seam line. If you use a serger to produce clothes for sale, this would be the type of machine you need. It will give a strong seam with a professional finish. As with a regular sewing machine, changing the length of the stitch is important for creating the type of seam you want. A smaller stitch would be the result of a shorter length, essential for creating a rolled hem. The serger has a blade which trims the raw edge of the material as it stitches a seam. This eliminates any loose threads or excess fabric. The width of the stitch controls where the fabric is cut. The stitch should hold the fabric tight enough for it to lay flat. When the width of the stitch is incorrectly adjusted you will get one of two results. Either the stitches will overhang the edge of the fabric or the fabric will bunch up inside the seam loops. You need to be able to adjust the tension of the stitches to create a perfect finish. Different fabrics will require varying tension settings, as will different types of seams, such as a rolled edge. Sergers can create a number of different stitches. Your project will determine the type of stitch you want. A two-thread overlocking stitch is generally better suited to finish a raw edge, leaving it flat and light. It would not usually be used on seams as it’s not very strong. Another two-thread stitch is a flatlock stitch, sometimes called a “faux coverstitch”. A rolled hem that uses two or three threads usually creates a more decorative effect. It is also a good option for creating a hem on lightweight fabrics. The three-thread overlock stitch is used quite often, although it’s not as strong as a four-thread stitch. It can create a blind hem that will be nearly invisible on a finished garment. The four-thread overlock stitch is the most durable and is generally used on the seams of clothing. A free arm is used to easily hem things such as cuffs and other cylindrical shapes. It enables the machine to sew in a circle. The needles used in sergers are sometimes specialized and may not be easy to re-stock. Some machines can use standard sewing machine needles. The weight of a serger can vary from about 13 pounds to over 20 pounds. If you don’t plan on giving it a permanent position in your home, make sure you can lift it to store it away easily. Sergers generally have additional accessories included such as extra needles, tweezers, and additional feet. Most accessories can also be purchased separately. Sergers are used to create professional, durable hems on fabrics such as knitwear, jersey, and denim. They trim and neaten the fabric as they sew. Coverstitch machines do not trim the fabric for you, and cannot produce the neatness a serger is capable of. They are, however, ideally suited to producing t-shirt hems, and the kind of raw hemming that is common in “Boho” and ethnic fashions. Sewing machines can produce a very basic zig zag hem, if you purchase the right machine. They can also do simple chain stitching, which is fine for crafting pillow slips and small, decorative items, but not suitable for garment work. A sewing machine will never produce a truly professional-looking hem. In terms of price, sewing machines are the cheapest option, ranging from $20 for a basic starter machine, to $350 for a something that would be suitable for the professional hobbyist with a high volume workload. Coverstitch machines range from $350 to over $800, making them the most expensive option. It is advisable to think about whether you genuinely need a coverstitch machine, if your budget is limited; sergers are a more common addition to the craft room, and come in, typically, at between $150 to $500. As with almost everything in life, you get what you pay for. The higher price brackets yield machines that can handle a range of fabric types, including thick and heavy duty fabrics, and provide a greater range of stylizing options. For those new to sewing, the order of purchase, machine wise, will usually be sewing machine-serger-coverstitch machine. The coverstitch machine is aimed more at the professional or semi-professional sewist. This is reflected in its pricing position, as the most expensive of the three machines. In terms of features, the serger typically doesn’t have a lot of bells and whistles, as it is dedicated to hem work. Sewing machine features will vary depending on price – the more you pay, the more options you get. While a coverstitch machine is, like a serger, a single-purpose machine, a good coverstitch machine will offer a wider range of features than an equivalent serger. However, because of its multipurpose functionality, a sewing machine, even a fairly basic one, is always the go-to option if it’s feature-richness you’re after. Sergers produce the strongest and most durable hem result. They can also offer a wider variety of hem styles. They are also better than coverstitch machines for decorative hems, and for adding edging fabric. Sewing machines are better suited to light craft work and domestic repairs, although they produce a reasonably strong chain stitch, which is suitable for joining fabric in, for example, a patchwork piece. A serger will help give a professional finish to your home sewing projects. They sew, overlock and trim seams, all in just one pass. While it won’t replace your traditional sewing machine, it will certainly be a useful tool for finishing garments. 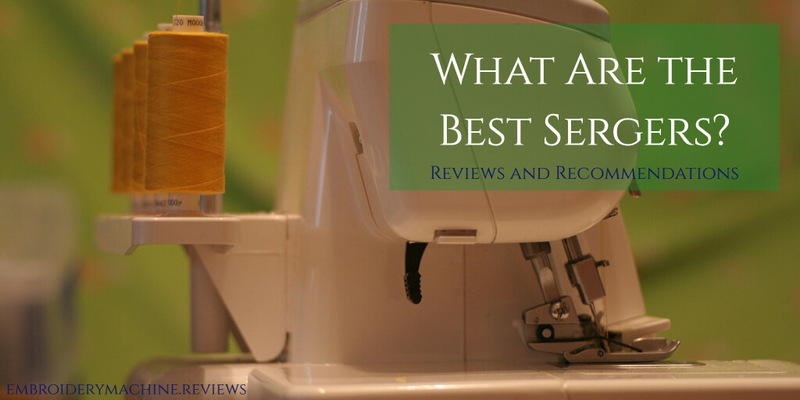 We have listed those machines that, in our opinion, are the best sergers. We hope our reviews will help you decide which one will meet your needs. You will soon be creating soft, stretchy clean seams on all your projects.